On Wednesday, October 4th at 1pm EST, iCarol will host a webinar on the topic of Crisis Center/Emergency Department (ED) partnerships, specifically those where crisis centers make follow-up calls to discharged patients who came to the ED presenting with suicidal thoughts or behaviors. Research shows that for about 1 in 5 deaths by suicide, the person had actually visited their local emergency department in the weeks before their death. While hospital EDs can keep a person safe in the short-term and provide referrals to long-term care, they aren’t often the best resource to handle the complex and ongoing mental health and emotional needs of someone who is struggling with thoughts of suicide. Most people who visit an ED for concerns related to suicide are discharged after a very short period of time, and the discharge plan often doesn’t involve ongoing direct contact to check and see how the person is doing following their visit, potentially leaving the patient feeling lost and unsupported. This is where more and more helplines are stepping in. Crisis Centers across North America have engaged in partnerships with their local emergency department to help provide care for ED visitors or discharged patients in the form of follow-up calls. Because crisis center professionals have the best knowledge, training, and resources to provide ongoing care such as this, EDs will make connections between the ED visitor to the crisis center. From there, crisis centers talk to the patient and make a series of follow-up calls or texts to the visitor to keep them feeling supported and engaged with a safety plan. Crisis centers are also best-equipped to see that a person receives referrals to more long-term mental health care or other needed referrals that can help resolve issues compounding a person’s distress and desire to end their life. Charissa Tvrdy is a Lead Crisis Clinician and Hospital Follow-Up Coordinator at Rocky Mountain Crisis Partners. Ms. Tvrdy is responsible for oversight and project management of RMCP’s Hospital Follow-Up program. She works as a liaison between RMCP and participating Colorado emergency departments. Ms. Tvrdy assists call center staff in the training, implementation, quality assurance and daily operations of the program. Ms. Tvrdy received her Master of Science in Counseling Psychology from The University of Kansas. She has experience working in a call center serving people experiencing behavioral health crisis. Ms. Tvrdy also has clinical experience within a Community Mental Health Center. Dr. Michael Allen built the model Comprehensive Psychiatric Emergency Program at Bellevue Hospital. He was chair of the APA’s Task Force on Psych Emergency Services, president of the Am Assoc for Emerg Psychiatry, member the NIH Emergency Medicine Roundtable, a National Suicide Prevention Lifeline steering committee member, a STEP-BD, ED SAFE and PRISM investigator and an author of the Suicide Prevention Resource Center’s ED Decision Support Guide. He has served as a subject matter expert for the US DOJ Civil Rights Div, CMS, NIMH, the Joint Commission and SAMHSA. He was instrumental in forming the Colorado Suicide Prevention Commission and the Colorado National Collaborative. He is currently Professor of Psychiatry and Emergency Medicine at the Johnson Depression Center, University of Colorado Anschutz Campus and Medical Director of Rocky Mountain Crisis Partners. Caitlin Peterson is the Coordinator of Best Practices in Care Transitions for the National Suicide Prevention Lifeline, working closely with crisis centers, professional organizations, community partners, and mental health providers to support and advocate for follow-up and partnership with crisis centers. Caitlin has worked in the mental health, crisis intervention, and suicide prevention field for over 10 years, 7 of those in various positions, and later manager, of a blended suicide prevention and information and referral hotline. She has a Master of Science degree in Marriage & Family Therapy from the University of Rochester School of Medicine and Dentistry. We hope you can attend — space is limited so please register ASAP if you’re interested in joining the live presentation. For those who can’t join us, we’ll have the recording available on our website at a later date. To learn more about this webinar and to register, click the button below. 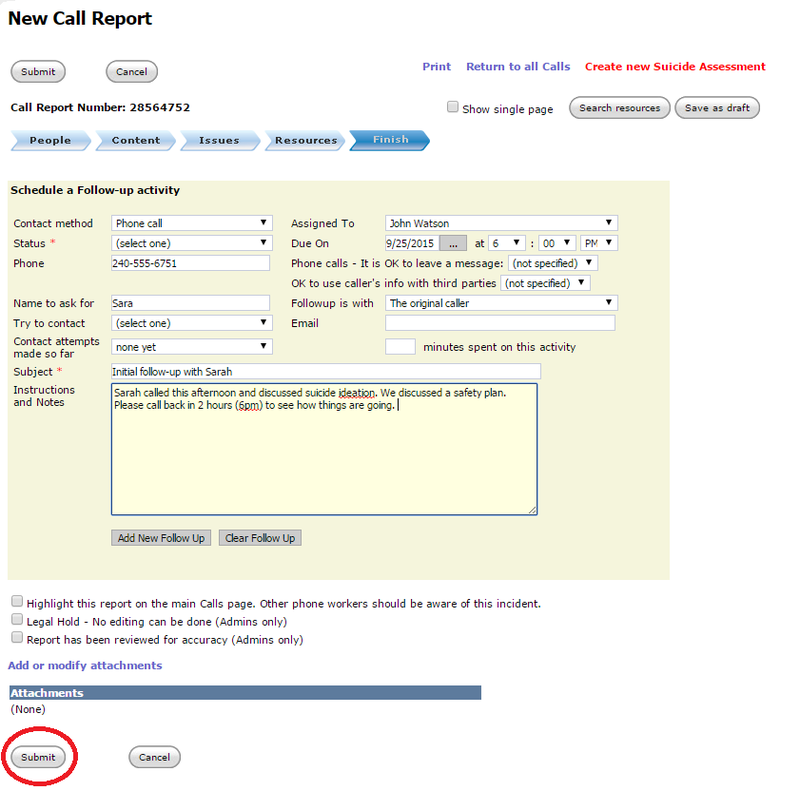 We recently enhanced the “Follow-up Activity” section of call report forms to allow for scheduling several follow-ups at the time that the original form is being filled out. Previously you could add just one initial follow-up activity when first filling out a new call form. 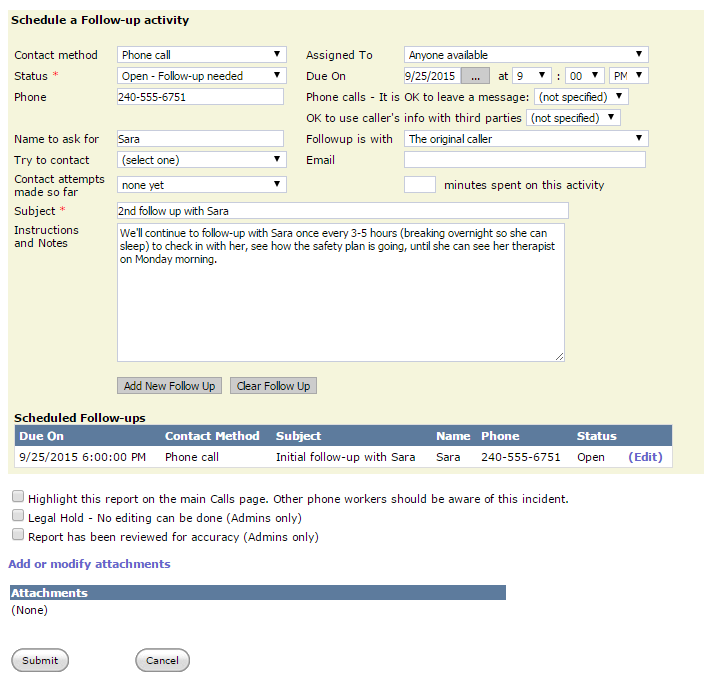 Scheduling additional follow-ups was possible, but it required that you first submit and then view or edit the report form before adding additional activities. These additional steps are now unnecessary. 1. If you’re only scheduling one follow-up for the client, do what you have always done, which is to fill out your reporting form, fill out the Follow-up Activity information on the ‘Finish’ tab of the form, and then Submit the form. Important Note: If you only want to add one follow-up activity, follow the steps above as written. You DO NOT need to click the “Add New Follow Up” button. 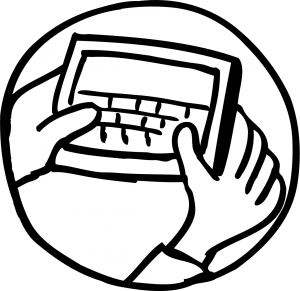 If you do, then enter the follow-up details again, two follow-up activities will be created. The Add New Follow Up button is only to be used if you want to add more than one follow-up activity at a time. 2. If you know at the time the initial report form is being created that this client should receive not one, but several follow-ups, you can schedule several follow-ups at this time, before submitting the form. After scheduling the first follow-up, click the Add New Follow Up button to save this follow-up and create an additional follow-up. 3. Once the first follow-up has been scheduled, you’ll see it listed under the Scheduled Follow-ups area. Then, your follow-up activity will be clear once again and you can now schedule an additional follow-up. Once the information is complete, click the Add New Follow Up button as you did before to add this second follow up. 4. You can follow steps 2 and 3 as many times as needed to scheduled a series of follow-ups for this client, before clicking the Submit button once finished. 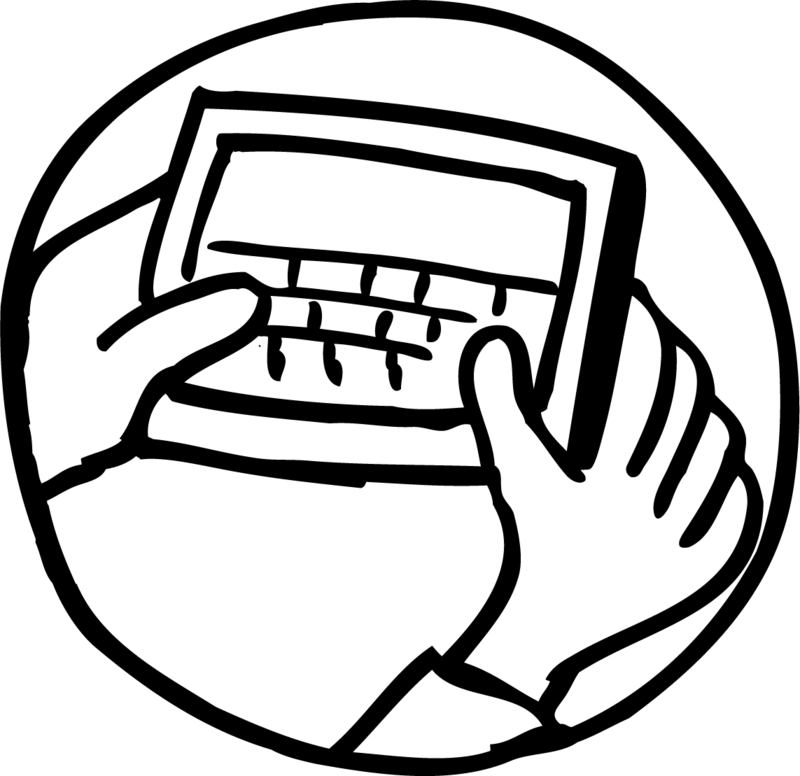 If at any point you make a mistake when filling out follow-up details, the Clear Follow Up button can be used to clear all details entered. You’ll still be able to add additional follow-up activities in both View or Edit mode of report forms just as you always could, but these new capabilities allow for a more efficient process if you’d like to schedule several follow-ups right from that first, newly created form. There are many scenarios in which you may know during the first interaction that a help-seeker will want or need several follow-ups. One example is shown in our screenshots above, where a caller presenting with thoughts of suicide may need several follow-ups to stay in touch and help them maintain a safety plan. In fact, many authorities on suicide prevention best practices suggest that ongoing follow-ups from crisis contact centers are an important part of successfully seeing someone safely through a period of intense suicide ideation. Other examples of multiple follow-up planning during the initial interaction could be planning out a series of surveys with a caller, or a series of follow-ups to follow their progression through an application process or other ongoing activity. By being able to set out and schedule these follow-ups all at once when completing the initial form documentation, your staff and volunteers will save some additional steps and clicks, which saves time and more quickly gets them back and available for the next call, chat, or text.